Another blog post about my stationery adventures in Shanghai. 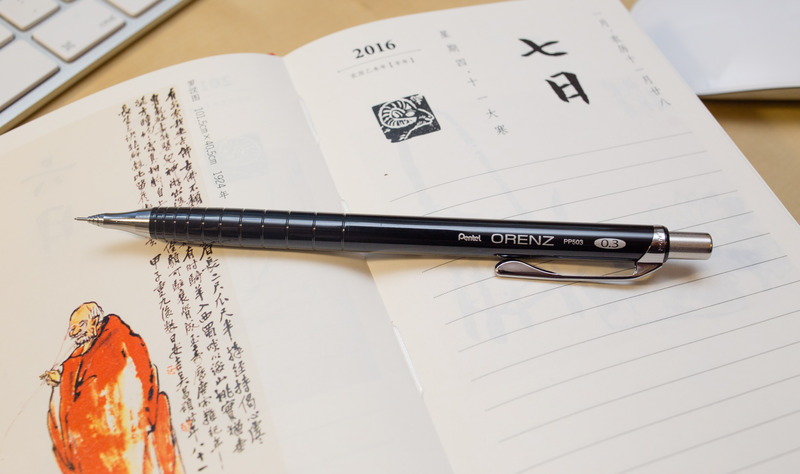 This time I want to show you another mechanical pencil I bought: The Orenz in 0.3. This is my fourth Orenz now, but the first one in 0.3 mm. I guess you might say I’m overdoing it a bit, but it is a really nice pencil, so I couldn’t resist trying out the 0.3 mm version. When I bought it I had certain expectations. Hypothesis 1: The 0.3 mm will need more force to slide the sleeve than the 0.2 mm version. This is based the assumption that there is a bigger area of contact between lead and sleeve and between the sleeve and the rest of the body, which would result in more friction. Hypothesis 2: The Orenz in 0.3 mm will need less force than the Staedtler Microfix S 0.5 to slide the sleeve. This is based the assumption that there is a smaller area of contact between lead and sleeve and between the sleeve and the rest of the body, which would result in less friction. I bought the black version for 50 元 (~$7.60; £5.20; €7) from Shanghai Jiajun Craft Gifts Co. Most stores on FuZHou Road charge 55 元, but one or two charged 50. I bought mine in one of the cheaper shops. Some of the Orenz in the shops had the Japanese packaging, some had the English packaging. On the web I have seen a gorgeous dark green version of the Orenz, but I’ve only seen it online so far – it wasn’t available in any of the shops I visited, so in the end I bought the black version because I didn’t like pink and I already have the white and blue versioning 0.2 mm. Well, I wasn’t keen on the black version when I bought it, but now I started to like it. With the right light the shiny black surface can look really good. What about the sliding sleeve? So what about the force needed to slide the sleeve. Hypothesis 1 was correct. When I checked I had to use 1 dN – 2 dN to slide the sleeve, certainly much more than what is needed for the 0.2 mm version. To my surprise Hypothesis 2 was not correct. I had to use more force to slide the sleeve of the Orenz in 0.3 mm compared to my Staedtler Microfix S 0.5 77305. To qualify this point: Other Orenz and especially other Microfix might behave differently. Some leads might have a slightly different diameter than others, which might result in different numbers when testing the force needed. 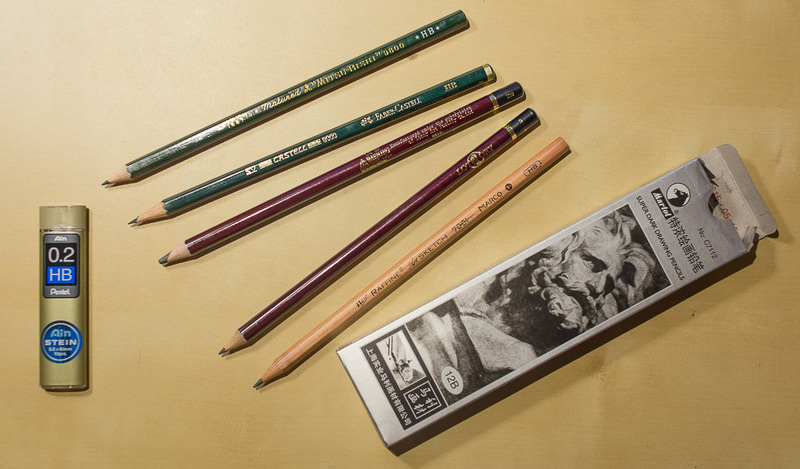 Plus: my Microfix was bought in the 1980s, Staedtler stopped selling them in 1988, so maybe it got better with time. On the other hand, maybe Staedtler just did a stellar job with the Microfix and created a sliding sleeve that is unsurpassed by modern pencils. Other items I bought in the shop include an Indonesian Castell 9000 and a 12B pencil from Lotory. I have added the Orenz 0.3 to my sliding sleeve table. The background of the first photos is a tribute to Lexikaliker, who kindled my interest in the Orenz – just that my background isn’t a Tenugui, but a Furoshiki – in my case a non-woven wrapping sheet from Muji. I have discussed the Indonesian version of the Castell 9000 in a previous blog post. To see the Orenz in its full beauty please open the Orenz images (the first three) in a new tab/window.